Pastors). She worked for the Church for 27 years, being paid far below the level of poverty, but maintained her commitment to helping the neediest, including albinos and anyone else who was suffering. Governed by a board of directors, comprised of seven individuals (mostly people with religious leadership and/or accounting expertise) from various African nations, Sister Martha is the principal for PAC – providing strategic and tactical leadership and management. PAC’s initial mission was to change discriminatory attitudes and practices toward people with Albinism and to improve understanding of issues that can improve the health of people with this disorder (Pierson-Lester 2015). They have sought to reverse adversarial attitudes toward people with Albinism and to enhance knowledge about medical issues related to this disorder in an effort to relieve suffering and prolong life of Albinos. Victims of Albinism in Africa have historically been subject to superstitions that associate people with the disorder as defective and attracting bad fortunate to their communities. Forms of discrimination against people with Albinism include violence (sometimes extreme violence), isolation, limited opportunity, and behaviors that put victims at unnecessary risk. Considerable progress seems to have been achieved in efforts to advocate for changes in public attitudes and policy with respect to people with Albinism (Pierson-Lester 2015). At the same time, PAC has engaged in public advocacy, it has also worked directly with Albino people inspiring dignity and positive self-image, helping them to understand how to protect their health, and by developing economic opportunity (Pierson-Lester 2015). Under the leadership of Sr. Martha, PAC decided to expand its mission to include community development for at-risk villages. When Sister Martha returned to Makiba, she found that of the nearly 100% of 7-year-olds who were starting Class 1 (First Grade), less than half completed the year, going instead to work in the mines. The lure of even a few shillings a day was a factor, but as she looked deeper, she found that these children, who had been abandoned for much of their first 7 years, were suddenly placed in a classroom where they were expected to sit still and attentively watch their teacher write on the blackboard for 7 hours a day. This proved very difficult for most of these children. Most dropped out and returned to work in the mines. Sr. Martha opened a private (tuition-free), Sr. Monica’s Preschool through second-grade children. Issues such as economic displacement and destruction of family organization (contributing factors addressed in the section on Makiba) has led to many orphaned children who often are unable to participate in school as they seek to provide for their most basic daily needs (e.g., food and shelter). Sister Martha herself was extremely poor, but she was given $100 by a former seminary professor and she found a man who wanted to trade an acre of land in Makiba for a bicycle, so Sr. bought him one and became a landowner. Then she called the village together, and inquired as to their vision for the land. There was strong support for starting a school. Village adults, due their own lack of education, did not believe they could educate the children and the existing public school was not proving effective for the most at-risk children. On that very day, villagers made enough bricks to build a two-room schoolhouse. Subsequently, Sister Martha was able to raise contributions to hire someone to build, a school. Work could only progress on weekends, which took many months. Another donation put a roof on the building, and they were in business. Sister Martha sent her sister to Montessori Teachers’ College to be trained as a teacher. It was believed that a Montessori approach would be more appropriate for engaging children in their education. This proved to be true. Sister Martha recruited a volunteer instructional assistant. For about 15 years, St. Monica’s educated an average of 45 children per year, ages 4-6. Recently, St. Monica’s received a commendation from the Village Education Officer. Student retention, educational progress, and graduation rates have been remarkable, despite the fact that this private school does not charge tuition. 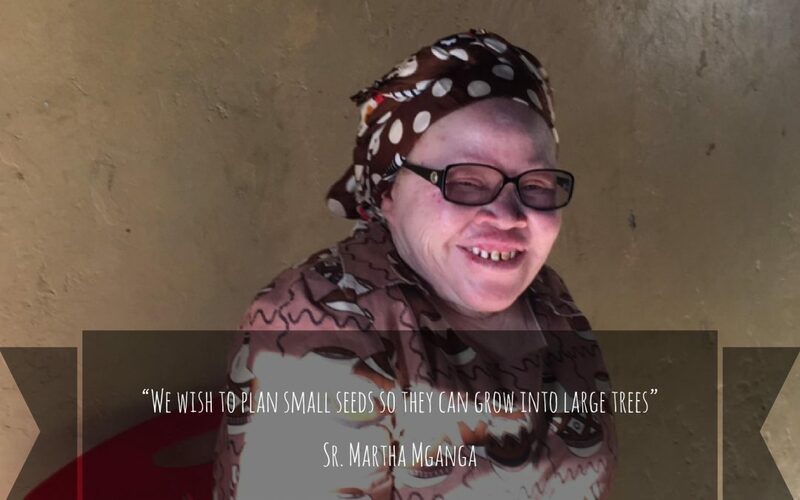 Sister Martha Mganga was encouraged to start a preschool in her little village of Makiba because there was a terrible explosion in the nearby tanzanite mines. The newspapers reported that 200+ adults were killed, but they did not report on deaths of children, because employment of children was illegal. Sister Martha believes there were about as many children deaths as adults, because they are favored by mining companies for being able to crawl through small tunnels (hence called nyoka, or “snake” in Swahili). This provided economic opportunity for mining operations, but put children at terrible risk. Economic conditions are favorable for exploitation. because that is rampant, but she learned that while nearly all 7-year-olds start Class 1, less than half of them finish the year, and they never return. She continued talking with children and families and learned that it was much due to the reality of the Tanzanian school system as economic circumstances. Students are expected to sit all day for rote learning, after having spent their first 7 years running free in the bush. They just couldn’t make the transition. And so she thought they needed a transition, a preschool, which would serve as a bridge to success in school. This is not dissimilar to how Head Start was started in the United States. Economic and environmental (in combination often referred to as social economic status) circumstances are significant factors. So Sister Martha worked with local family members and villagers in building a vision for a new, private school. Despite an absence of funding, on a Saturday morning, she invited all villagers to help her make mud bricks. “I can’t pay you, but I can feed you,” she said, and she cooked them lunch. In one day they made the 800 bricks they needed for a small, 2-room school house. After that, she recruited a man with construction experience to advise her and her sister Elizabeth (both women with albinism) and they built the school themselves on weekends. Sister Martha had previously been trained in the Montessori Method (she was Head Teacher of an Anglican school in Arusha at the time), and she personally paid for her sister Elizabeth to be trained too. That was 15 years ago. Since then there has been an average of 50 children in the school, 3-4-year-olds in one classroom and 5-6-year-olds in the other. Currently, St. Monica’s has 60 students. The local government recently gave them an award for their students having greater success in completing Class 1 than any of the other kindergartens in the District. With the support of many village women, PAC established a school for very young children that attempts to both encourage education and help meet basic daily needs. PAC believes that education is a significant factor in reversing many of the systemic challenges confronting villages such as Makiba. The school has been in operation for nearly two decades and utilizes the Montessori curriculum. It has a two-room building and is staffed by two teachers. PAC has also engaged in strategies to empower women by developing micro-enterprises where women support each other and develop products that are sold through various fair trade market distribution channels (Browder 2014, Turner 2014). PAC has developed a successful approach to both making and distributing products. It offers effective training on entrepreneurialism and product quality. PAC presently operates two micro-enterprises, which are essentially sewing centers (Turner 2014). One is located in Arusha, the other in Makiba. The one in Makiba is relatively new, presently making only one product – a fabric-bead material scarf/necklace. Six women participate in the Makiba operation, which needs considerable assistance in expanding competencies and scale. Still, it appears that early efforts are taking root.